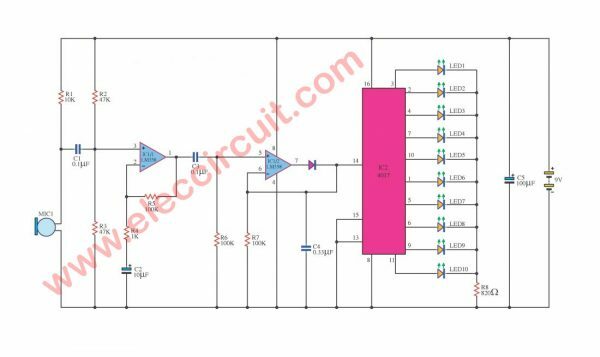 This is a Dancing LED with Music circuit diagram that features a running pace with a changing voice, the tiny microphone. For a frivolous fun. Operation of the circuit when a signal is to change the MIC1 audio signal and power amplifiers to be stronger. The LM358 IC1 / 1 and IC1 / 2 classified as a circuit that changes the electrical signal of the audio signal to be square, to control the operation of pin 14 of IC2. IC2, which is connected to the circuit. The output pin voltage is out sort of leg 3, 2, 4, 7, 10, 1, 5,6, 9 and 11. On IC2 controls the signal LED lights chasing each step on the moon. The number of square wave signal to the pin 14. The R8 help restrict the current flowing through the LED accordingly. What is the Number of diode between pin 14 and ic 2 ? What is the configuration of diode?